The Old Town Trolley Tours of Key West are a great way to ease into Key West, without breaking a sweat. For over 30 years, they have been providing sightseeing tours, and for the first time visitors to Key West we would recommend getting on board and being taken around the streets across the area, whilst being educated and entertained by the informative tour guides. You can then make your own way back to things that particularly interested you at a time that is convenient. It's particularly useful as the tours will make their stops at most of the major hotels in the area, so if you time it right you can walk out of your air conditioned room straight onto the trolley bus and away you go. How Often Do The Trolley Tours Run? The trolleys depart every 30 minutes, and you can get off at any of the twelve stops along the way, as you pass over 100 Key West attractions and points of interest. If you have just missed a trolley generally you only have twenty minutes to wait until the next one comes along. And amazingly they are pretty accurate as to the waiting time. Even with navigating the crowds around the place, they are generally never more than a couple of minutes later than the twenty minute estimated arrival time. What About If I Want To Visit For The Day In A Car? 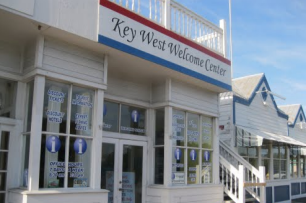 If you are just a day visitor to Key West then there is free parking at the Key West Welcome Centre, which is extremely useful to leave your car, and pick up the tour as it passes by. If you have young children under the age of twelve then they ride free, and for any parents who have kids moaning about tired legs two minutes after setting out for the day, the trolley tours are of course a useful diversion, and gives Dads shoulders a break from little wiggling bottoms. Remember that the tours will give a second day ride for free, so why not buy a ticket and take the tour on one day, and then the next just use it as a free taxi, as you continue to find all the attractions that sit on every corner of Key West. When we jumped on board we met Louie, who is an amazingly entertaining tour guide and man who he love his job. He has been doing it for years and still good humour and a great personality comes out of every pore of him. He had us chuckling for the whole way round, and although we had planned to jump off at a certain stop we stayed the whole way round just to hear him talk. Louie should be listed as Key West attraction himself!! 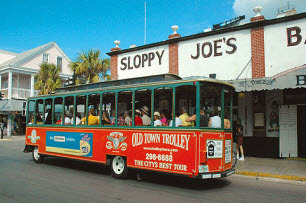 All in all the Old Town Trolley Tours of Key West are one of our top recommendations. Save cash with our great discounted tickets for the Old Town trolley Tours. See the best of Key West, without breaking a sweat.